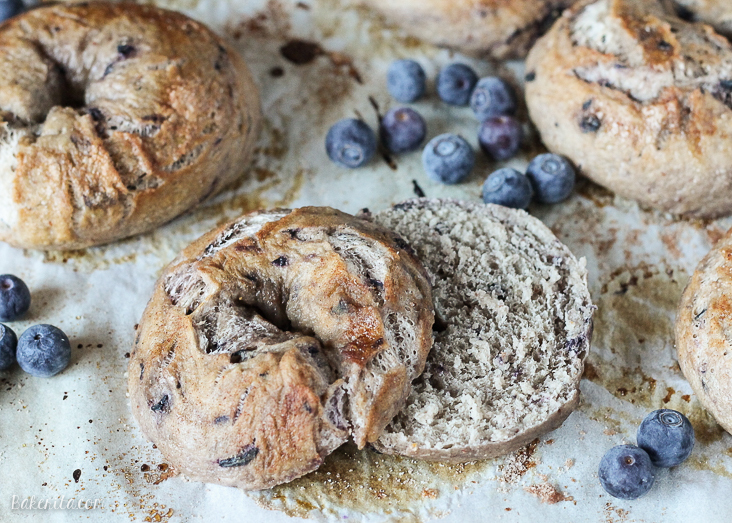 These homemade Blueberry Bagels have a sweet blueberry flavor and toast up beautifully! You’ll love having fresh bagels for breakfast, and they take less than 2 hours to prepare. 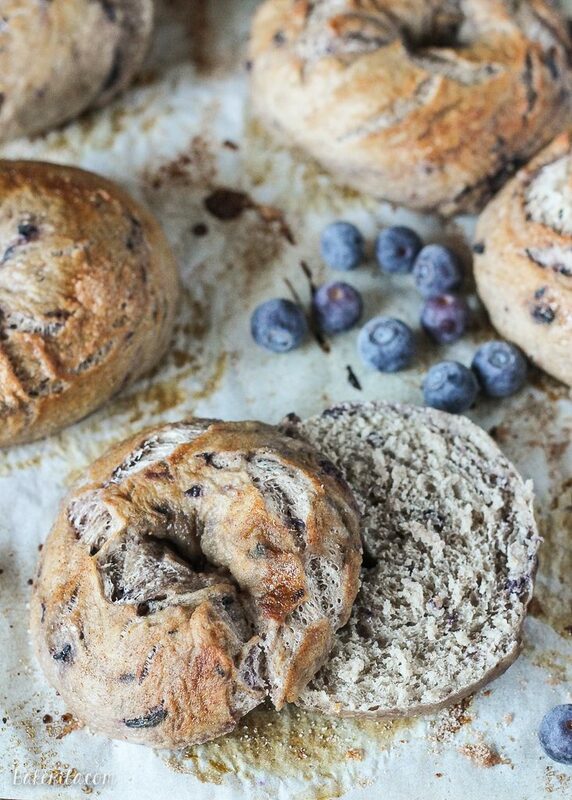 Blueberry bagels from your ingredient bowl to your mouth in 2 hours? It’s possible, and yes, you should most definitely spend 2 hours of your life, preferably soon, making your own bagels. If you don’t want it to be blueberry bagels, hope on over to my recipe for asiago everything bagels. They were amazing, and also done in 2 hours. And they had cheese melted all over the top of them, and cheese + bread makes me very happy. But back to blueberry. Since I made bagels the first time, I’ve made them multiple times, mostly cause my housemates always ask for them. Something about homemade bread is just so comforting, and ripping into a bagel that just came out of the oven is an experience you need to have. Also, they only take 2 hours! And a whole bunch of it is rising time, so…why not make homemade bagels? This recipe comes together quickly in a stand mixer. You could do it by hand, but you’ll be kneading for a while since this dough is a little drier. I recommend a machine. You combine all the ingredients, including instant yeast because no one likes to mess around with all that proofing business, and let the dough knead for a while – almost 10 minutes, adding more flour if necessary. Your dough may turn a pretty shade of purple. That’s supposed to happen. Now, let the dough rise for about 20 minutes in a warm place or if you want to make these ahead of time, stick the dough in the fridge overnight to let it rise and continue tomorrow. After the dough has risen, divide the dough, form your bagels, and give them a little swim in some boiling water. That gives bagels their signature chew, and the longer you boil, the chewier the crust will be. After they’re boiled, sprinkle them with cinnamon sugar and send them into the oven. About 30 minutes later, you’re left with some beautiful blueberry bagels just begging to be slathered with cream cheese or butter and devoured. We had a ton of baked goods around when these were made (I went a little crazy…) so I sliced them and stuck them in the freezer so they stayed good. They toasted up perfectly from the freezer, so these would be great to make ahead and have on hand, if they last that long. It’s homemade bagel time. You should join in. Enjoy! Combine 2 cups bread flour, yeast, honey, salt, sugar, cinnamon and warm water in the bowl of a stand mixer fitted with a dough hook attachment. Mix on low, slowly add 2 more cups of flour. Mix on low until most of the loose flour has been worked into the dough and the dough looks shredded, about 2 minutes. Add the blueberries. Dough may get wet as they incorporate, add more flour as necessary. Increase the speed to medium low and continue mixing until the dough is stiff, smooth, and elastic, about 8 to 9 minutes more. Add more flour if necessary. Shape the dough into a ball, place it in a large oiled bowl, and turn it to coat in oil. Cover the bowl with a damp towel and let the dough rise in a warm place, until it is puffy and springs back when you poke it, about 20 minutes. It will not double in size. While the dough rises, preheat the oven to 425°F. Fill a saucepan with water and bring to a boil over high heat, then reduce heat to medium low and let simmer. Cover until you’re ready to boil the bagels. Line a baking sheet with parchment paper greased with oil or cooking spray. Place a metal rack inside of a second baking sheet and set aside. Turn the risen dough out onto a dry surface. Divide the dough into 12 equal pieces, about 3 ounces each, for smaller bagels, or into 8 pieces, about 4 ounces each for larger bagels. Roll each piece into a 9-inch-long rope, lightly moisten the ends with water, overlap the ends by about 1 inch, and press to join so you’ve created a bagel. As necessary, widen the hole in the middle so it is approximately the size of a quarter. Cover the shaped bagels with a damp towel and let rest 10 minutes. After resting, stretch the dough to retain the quarter-size hole (the dough will have risen a bit) and boil the bagels, taking care not to overcrowd the pan (I could only boil 2 at a time). Make sure they have room to bob around. Cook for about 30 seconds on each side until the bagels have a shriveled look, then remove to the baking sheet with the rack in it. Adjust heat as necessary so the water stays at a simmer. Stir together the sugar and cinnamon. Once all of the bagels have been boiled, whisk together 1 tablespoon water and the egg white until evenly combined. Brush the egg white mixture onto the bagels. Sprinkle the cinnamon sugar mixture evenly over the bagels. Arrange the bagels on the baking sheet lined with parchment paper about 1-inch apart and bake. You may need to do it in two rounds. Rotate the pan after 15 minutes and bake until the bagels are a deep caramel color and have formed a crust on the bottom and top, about 10 minutes more. Remove from the oven and let cool on a rack for at least 30 minutes so the interiors finish cooking and the crusts form a chewy exterior. YES! Homemade bagels > Store bought! I LURVE making my own bagels, but have never tried adding fruit. Just ship these right on over to my face girlfriend! Pinned! I love these, Rachel! 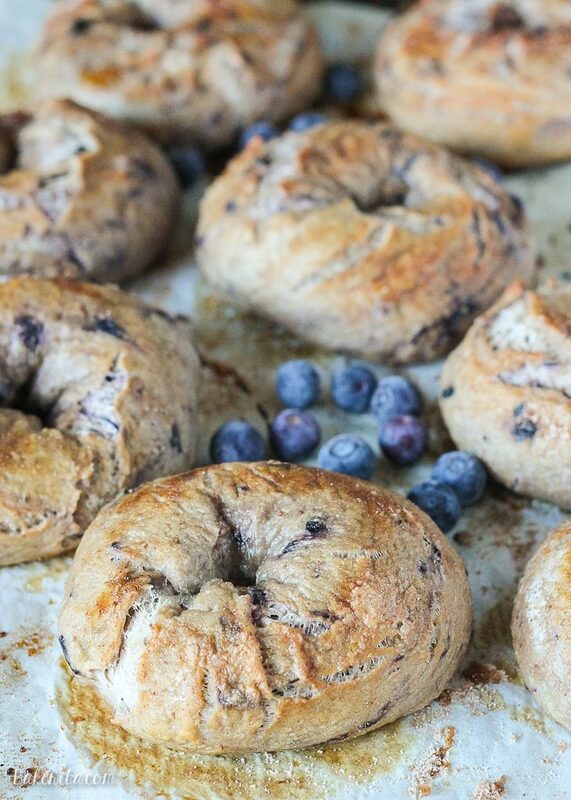 There is NOTHING like a fresh, warm bagel and that cinnamon/sugar topping for these blueberry ones? Perfection. Haha, yes! Possibilities are endless, and you can never have too many homemade bagels! Thanks, Rachelle. There’s nothing like homemade bagels! Yours look amazing!! I’ve always wanted to make bagels at home!!! love these blueberry bagels!! and your asiago everything bagels!!! oh my gawd, YUM!!! I wish I was one of your housemates. Then I could have eaten 1 of these bagels warm from the oven. I just love bagels. These blueberry ones look perfect Rachel! Those bagels looks so perfect. Chewy on the outside, soft on the inside! The chances of me getting a blueberry bagel tomorrow after seeing this are very high! Love this and your photos are gorgeous as always! I can’t believe that I’ve NEVER made bagels at home. I need to change that ASAP. These look fantastic. I can understand why your housemates ask for these all the time. Love the color! Thank you for stopping by, Johlene! :) So glad you’re here. Homemade bagels? Can you say heaven. I love a good bagel but have never been brave enough to try and make them myself. I had no idea that they only took 2 hours to make. Lynn, before I had tried, I had no idea either! Now that I know how easy they are, I want them all the time. Your bagels look absolutely perfect! I can’t believe it only takes 2 hours. I need to try making them for the first time myself. These look perfect, Rachel! I love making my own bagels but have never been able to get blueberries to work for me. I have a hard time getting them to mix in the dough. Looks like I am going to have to try again, yours have made me hungry! Jen, I mixed them into the dough when it was barely starting to come together and let the dough hook do the work. I did need to add more flour than necessary which is mentioned in the recipe because they add a little moisture, but they turned out great :) Thanks for your kind words! Bagels make every breakfast so much better! The blueberries should be fresh and not frozen, right? I love these blueberry bagels! I have never made homemade bagels but you have inspired me. Perfect comfort food for a cold morning! 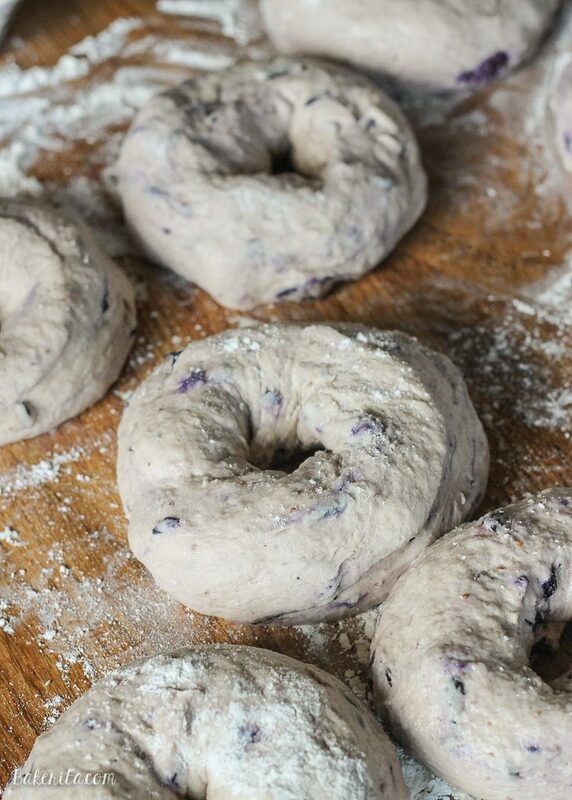 Holy cow – your very own homemade blueberry bagels. This is seriously impressive! I’ve never even eaten one. Love it. I’ve made bagels from scratch only one time in my life and it was many many years ago. You have inspired me, my friend. These look amazing!! Really amazing!! Yum! I have always wanted to try and make bagels but was a little intimidated. I will be trying this! I have never made homemade bagels but I think I may have to try. Blueberry and cinnamon raisin are my favorite! These look so tasty I just want to toast one up, throw some butter on it and get it in my belly. Wow, these look incredible! 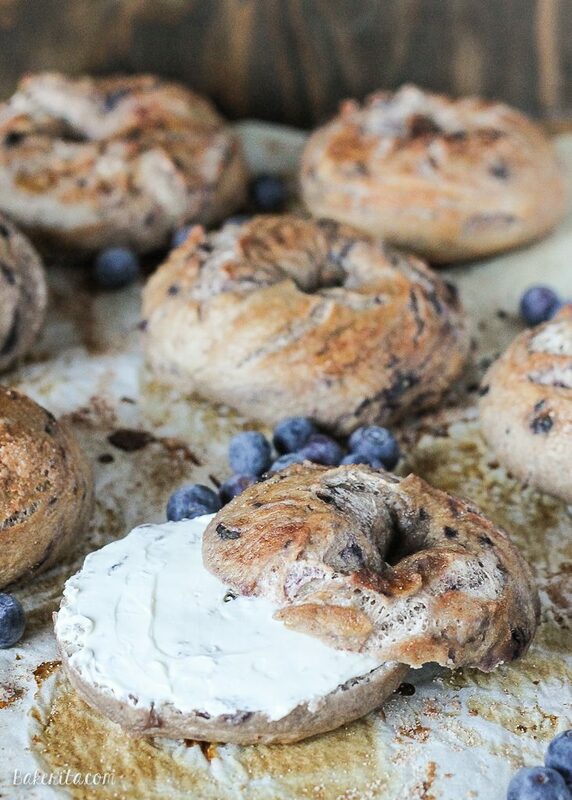 I am dying to try homemade bagels soon and these may have to be my first. I have some maple butter that would go perfectly with these! Oooh, these would be awesome with maple butter. Thanks, Rachel! I’ve never tried making bagels before. I just always assumed it was too hard. But you convinced me to give it a try. These looks amazing! Pinned! Ah homemade blueberry bagels! These are beautiful! One of these days I am gonna get the courage to whip these up! Pinning for later! Thanks so much, Andrea! They really are so much easier to make than I ever thought they would be. It’s like you read my mind… I’ve practically been dreaming about making my own bagels lately but didn’t know where to start, I’m going to have to give your recipe a whirl, they look great and do-able! Rachel, you nailed it with these bagels. My favorite! Can’t believe it takes just two hours! Your bagels look perfect! Blueberry bagels are my favorite. I know! The first time I tried bagels I was so surprised by how quick they were. Thanks! Oh my gosh, these look so good! I’ve been dying to try making my own bagels. They’re my favorite!! Now I want one! How gorgeous are these beauties! I love homemade bagels and especially ones that come together this quickly! Nice work!! Hi Melissa, yes you brush the egg white on before the cinnamon sugar. Sorry about that, I updated the recipe. I was able to using a large baking sheet, but if yours are smaller I would recommend baking the two pans at separate times. Hi Jessica. I used fresh, but you could use frozen – just note the bagels might turn blue because blueberries give off a lot of color as they defrost! Hope everyone enjoys the bagels :) happy holidays! Any idea what the nutrition could be on these?? They’re wonderful! Hi Ashley, you can check the nutrition information using this nutrition calculator. Glad you enjoyed them!! These are AMAZING! I put everything in my bread machine on the dough/pasta setting and stopped it after the kneading finished. Thank you for the great recipe! You could use all purpose flour instead, but you may need to add a little extra based on how the dough feels. I just wanted to let you know that I made these yesterday and they turned out wonderfully! I used the recipe to make blueberry, but also just plain and plain with cinnamon on the outside. The whole family loved them and we enjoyed making them. Thanks for providing us a great recipe that we will surely use again and again. So thrilled you enjoyed these Joseph! Thanks so much for your feedback. I can’t wait to try these tomorrow morning- I wonder if I could use dehydrated blueberries, just to reduce the extra moisture fresh or frozen blueberries gives off? Hi Jenny, using dehydrated blueberries will definitely work. Enjoy! Hi there! I’m super excited to give this recipe a try! In the ingredients list for the actual bagel (not the topping), it says 1 teaspoon cinnamon. But in the instructions, I don’t see when to add that in. I’m assuming it’s along with the flour, salt, etc…but wanted to make sure!! Thanks so much. Hi Steph, thanks for catching that! You’re right, it’s added with the rest of the dry ingredients. I’ll update the recipe now!